Kirkland is divided into 13 Neighborhood Associations. The purpose of the Associations are to create a sense of community and to function as links to the city government. ​The Moss Bay Neighborhood Association communicates with residents through in-person meetings, this website, and email updates. 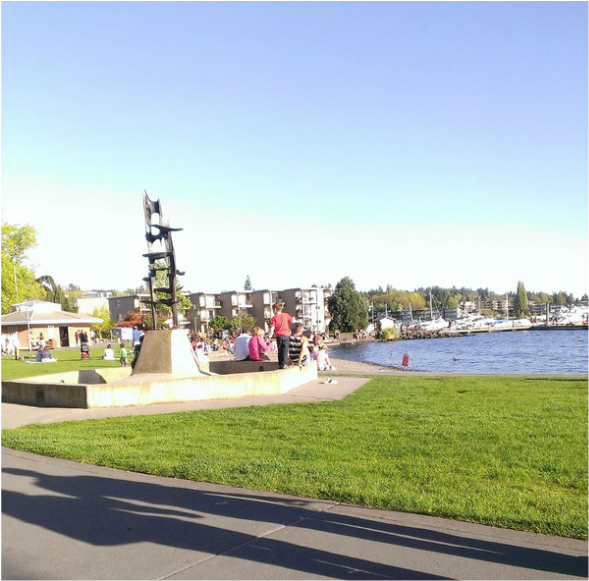 Communications to the Association include information from Kirkland City Council, staff and regional government, and news about business and other topics that impact our quality of life. ​​In turn, the Neighborhood Association is a means of communicating preferences, requests and concerns to the City Council and staff. This communication occurs when City staff attends our in-person meetings, through City programs and online. ​City funding is available to the Moss Bay Neighborhood through the Neighborhood Safety Program and grants. You are encouraged to participate in in Moss Bay meetings and communications so that you have a voice in how these funds are spent. We meet the 2nd Monday of odd months, but take the month of July off. ARTICLE I PURPOSE: The purpose of the Moss Bay Neighborhood Association is to maintain and improve the unique residential and commercial characteristics of the Moss Bay Neighborhood Association. Section 1 NAME OF ORGANIZATION: The name of the organization shall be Moss Bay Neighborhood Association (MBNA). a. To protect, keep safe, and provide quality of life for our neighborhood and its residents. b. To enhance the livability of the area by establishing and maintaining an open line of communication and liaison between the neighborhood, government agencies, and other neighborhoods. c. To provide an open process by which all members of the neighborhood may involve themselves in the affairs of the neighborhood. d. To do and perform all of the activities related to said purposes, to have and enjoy all of the powers granted and engage in any lawful activity for which corporations may be organized. e. Notwithstanding any statement of purposes or powers aforesaid, this association shall not, except to an insubstantial degree, engage in any activities or exercise any powers that are not in furtherance of its specific and primary purpose. ARTICLE II MEMBERSHIP QUALIFICATIONS: Membership in Moss Bay Neighborhood Association shall be open to all residents and property owners. A resident/property owner shall be defined as anyone who lives or owns property within the boundaries of Moss Bay Neighborhood Association as defined in Article XI of these bylaws. Section 1 ELECTED MEMBERS: All candidates for board membership by election shall have been a resident of the district for candidacy for a minimum of 30 days prior to the last day of the filing period and a resident of the MBNA neighborhood for 90 days prior to the last day of the filing period. Section 2 MEMBERSHIP VOTING: All residents, located within the Moss Bay neighborhood boundaries, 18 years of age or older, shall have one vote each to be cast during attendance at any general or special meeting. Section 1 DUES: The members of the MBNA shall be annually assessed a fee of $15.00 for the operation and maintenance of MBNA. In addition, any and all voluntary contributions will be accepted. Activities to raise funds for MBNA use may be held if appropriate. Section 1 GENERAL MEETING: There shall be at least one general membership meeting yearly. The meeting shall be convened in the fall and spring and upon any day decided upon by the majority vote of the board of directors. Notification for all general meetings shall require seven (7) days advance written or telephone notice to all active members of MBNA. "Active member" is defined as one who has attended at least one of the last two general or special meetings of the membership. Section 2 SPECIAL MEETINGS: Special meetings of the membership may be called by the chairperson or the executive board as deemed necessary. Notification and purpose of the special meeting shall require seven (7) days advance written, email or telephone notice to all members. Section 3 AGENDA: Subject to the approval of the board of directors, the chairperson shall prepare the agenda for general and special meetings of the membership. Any person may add an item to the agenda by submitting the item in writing to the board of directors at least three (3) days in advance of the membership meeting. Any member of MBNA may make a motion to add an item to the board, general or special agendas at those respective meetings. Adoption of that motion requires a second and majority vote. Section 4 QUORUM: A quorum for any general or special meeting of MBNA shall be a minimum of six members. Unless otherwise specified in these bylaws, decisions of the MBNA shall be made by a majority vote of those members present at any meeting. Section 5 PARTICIPATION: Any general, special, board or committee meeting is open to any person and all who wish to may be heard. However, only those eligible for membership are entitled to vote. All actions or recommendations of the general or special meetings shall be communicated to all affected parties, including minority reports. Section 6 PROCEDURES: The MBNA shall follow Robert’s Rules of Order (Revised) in all areas not covered by the bylaws. Section 1 COMPOSITION OF BOARD: The Executive Board, hereinafter referred to as the board, shall be composed of a chairperson, CO-chairperson, secretary and treasurer. The Board of Directors shall determine the exact number of board positions annually. There shall be at least 6 and not more than 12 members. a. CHAIRPERSON: The chairperson shall prepare the agenda and preside at all meetings of the board and membership; shall appoint members of committees not elected, with a majority approval of the board, except for members of the Grievance Committee. b. CO-CHAIRPERSON: The first alternate shall assist the chairperson; in the chairperson’s absence shall function as chairperson. c. SECRETARY: The secretary shall keep minutes and written records of majority and minority opinions expressed at all meetings; shall be responsible for all correspondence of the MBNA; shall make records of MBNA available for inspection for any proper purpose at any reasonable time. d. TREASURER: The treasurer shall be held accountable for all funds and shall give an accounting at each general meeting; shall receive, keep safe, and disburse MBNA funds, but such disbursement shall require the signature of one other board member. e. BOARD MEMBERS-AT-LARGE AND COMMITTEE CHAIRPERSONS: Chairpersons of committees shall inform the board and the MBNA of all activities of their respective committees. a. MANAGEMENT: The board shall manage affairs of MBNA in the interim between general meetings. The board shall be accountable to the membership; shall seek the view of those affected by any proposed policies or reactions before adopting any recommendation on behalf of the MBNA; and shall strictly comply with these bylaws. b. VACANCIES: The board may fill any vacancy on the board or a committee by majority vote of the board in cases involving absences by a board or committee member from three (3) consecutive meetings. A member appointed to fill a vacancy shall serve the remainder of the unexpired term and until his/her successor is elected or appointed. c. BOARD MEETINGS: The board shall meet at least fourteen (14) days prior to any general or special membership meeting and at any other time the chairperson may designate. These meetings shall be open session; however, only board members shall be entitled to vote. A quorum for board meetings shall be at least three (3) board members in attendance; decisions shall be made by majority vote. Directors shall be notified of board meetings in writing, by email or by telephone in advance. A majority of board members, by signed petition, may call a board, general or special meeting. d. EMERGENCY POWERS: In such cases where the board is required to provide neighborhood response before the question is presented to the membership, the board must indicate to the questioner that this is the case, and shall present the action taken at a special or general meeting with 30 days, or within a reasonable time for ratification by the membership where circumstances dictate. Section 1 COMMITTEES: The MBNA board shall establish both standing and ad hoc committees as it deems necessary. Committees shall make recommendations to the board for board actions. Committees shall not have the power to act on behalf of the organization without specific authorization from the board. Section 1 ELIGIBILITY: Only persons eligible for MBNA membership shall be qualified to hold an elected or appointed position. Section 2 BOARD MEMBERS: Members of the board shall be elected to serve for one (l) year until the appropriate general meeting. The election at the meeting shall be by nomination from the floor and requires a majority vote of the membership present. The board membership elections will be held at the annual general membership. Section 3 COMMITTEES: Committees shall have elected committee chairpersons with nominations being taken from the floor and shall require a majority vote of the membership present. The chairperson shall then call for the volunteers to fill committee memberships. In the case of insufficient volunteers, the board will fill the vacancies. Section 4 IMPEACHMENT: A majority of the board may submit a written request for a board member’s resignation at a board meeting. If the board member chooses not to resign, then any holder of an elected position may be removed and replaced by a two-thirds (2/3) vote at a general or special meeting. Section 1 PERSON OR GROUP ADVERSELY AFFECTED: A person or group adversely affected by decision or policy of the MBNA may submit in writing a complaint to any member of the Grievance Committee. Section 2 RECEIPT OF COMPLAINT: Within seven (7) days of receipt of the complaint the committee shall arrange with the petitioner a mutually acceptable place, day and hour for a review of the complaint, and will in writing, within thirty (30) days, recommend a resolution of the grievance to the board. Section 3 FINAL RESOLUTION: The committee shall attempt to resolve the complaint and shall submit a report of their recommendation and/or action to the complainant, board and membership. If the committee, board and petitioner cannot reach agreement, final resolution of the complaint shall be by vote of a majority of the membership at a general or special meeting. Section 1 EXECUTION: The board shall be responsible for execution of this article. Section 2 SUBMISSION OF PROPOSALS: Any person, group or city department inside or outside the boundaries of MBNA may propose in writing items for consideration and/or recommendation to the board. The board shall decide whether proposed items will appear on the agenda of either the board, special committees or general or special meetings. Section 3 NOTIFICATION: The proponent and members directly affected by such proposals shall be notified in writing of the place, day, and hour the proposal shall be reviewed not less than (7) days in advance. Section 4 ATTENDANCE: The proponent may attend this meeting to make a presentation and answer questions concerning the proposal. Section 5 DISSEMINATION: The MBNA shall submit recommendations and dissenting views as recorded from the meeting to the proponent and other appropriate parties. ARTICLE X ADOPTION AND AMENDMENTS: Adoption of and amendments to these bylaws shall require a two-thirds (2/3) vote by the members present at a general meeting. Section 1 BOUNDARIES: Boundaries of the MBNA shall be defined as specified in the City of Kirkland’s Comprehensive Plan for the Moss Bay Neighborhood. The northerly boundary begins at the center of the intersection of NE 85th Street and Kirkland Way and then westerly to the intersection of the northern boundary of NE 85th Street and BNSF RR intersection and extends westerly along the northern boundary of NE 85hth Street to the centerline of 6th Street. It then extends northerly along this centerline to the centerline of 7th Avenue where it turns and proceeds west to the centerline of 5th Street. The boundary then extends south along the 5th Street centerline to a point intersecting with the extension of 4th Avenue and westerly along the 4th Avenue extension and 4th Avenue to the centerline of 3rd Street. The southern boundary then extends north along the 3rd Street centerline to 4th Avenue and subsequently follows the 4th Avenue alignment westerly to 2nd Street and then south on the 2nd Street centerline from 4th Avenue to 3rd Avenue. Then along 3rd Avenue to centerline of 1st Street, then southerly along the centerline of 1st Street to the point of intersection with property line between lots two and three of block 216, Kirkland Addition. Then westerly along said property line to the centerline of Market Street. The boundary then proceeds along Market Street to the point of intersection with the Inner Harbor Line along Lake Washington. The westerly margin extends along the Inner Harbor Line of Lake Washington from the centerline of Market Street to the extension of the centerline of NE 68th Street. The southern boundary proceeds along the centerline of the extension of NE 68th Street and NE 68th Street from the Inner Harbor Line of Lake Washington to the centerline of the BNSF RR. The eastern boundary extends along the centerline of the BNSF RR from the centerline of NE 68th Street to the centerline of Kirkland Avenue and then easterly along this centerline to the centerline of Railroad Avenue. The boundary then follows the centerlines of Railroad Avenue and Kirkland Way northeasterly to the centerline of NE 85th Street. The undersigned, for the purpose of forming a corporation under the nonprofit laws of the State of Washington, RCW 24.03, hereby adopts the following Articles of incorporation. The name of the corporation shall be: Moss Bay Neighborhood Association. The term of existence shall be: perpetual. In the event of dissolution of the corporation, the net assets are to be distributed as follows: all monetary assets to be donated to Kirkland Interfaith Transitions in Housing (KITH), 125 State St, Suite B, Kirkland, WA 98033; phone 425-814-6317.